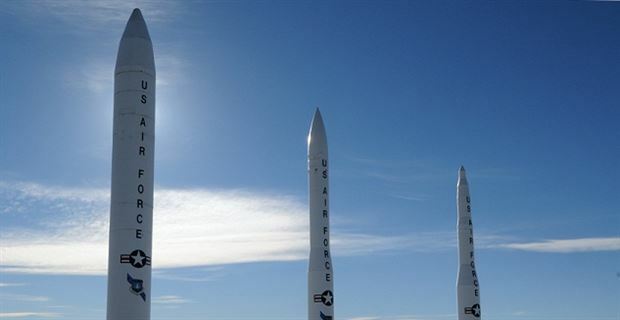 The Air Force plans to fire off new prototype ICBMs in the early 2020s as part of a long-range plan to engineer and deploy next-generation, high-tech intercontinental ballistic missiles with improved range, durability, targeting technology and overall lethality, service officials said. Northrop Grumman and Boeing teams were recently awarded Technology Maturation and Risk Reduction deals from the Air Force as part of a longer-term developmental trajectory aimed at developing, testing, firing and ultimately deploying new ICBMs. Initial subsystem prototypes are included within the scope of the current Boeing and Northrop deals, Col. Heath Collins, System Program Manager, GBSD, told Scout Warrior in an interview. “Over the next three years, the GBSD prime contractors will develop and test those prototypes to demonstrate technical and integration design maturity. In the end, these prototypes will burn down risk early to ensure successful execution of the next acquisition phase,” Collins said. Following this initial 3-year developmental phase, the Air Force plan an Engineering and Manufacturing Development phase and eventual deployment. Much attention has been focused on nuclear deterrence and the need for the US to modernize its arsenal, particularly in light of recent North Korean threats. Senior nuclear weapons developers have told Scout Warrior that upgraded guidance packages, durability and new targeting technology are all among areas of current developmental emphasis. While, quite naturally, many of the details of the emerging new ICBMs are not available for discussion for security reasons, Collins did elaborate a bit on the systems engineering strategy being employed by Air Force developers. Collins, an engineer himself, explained that the current acquisition strategy prioritizes model-based systems engineering designed to expedite technological development. “Our approach to systems engineering leverages the power of 21st century technology to allow the program office to better "Own the Technical Baseline" through a spectrum of tools, models and simulations in a collaborative and interactive data environment,” Collins said. The strategy, Collins explained, is intended the Air Force to better manage program and technical complexity through digital traceability and aggregation. “This provides a single source of truth across the weapon system design, and allows a more comprehensive and deeper understanding of the architecture and design,” he said. It is within this conceptual framework, designed to save millions of lives, prevent major great-power war and ensure the safety of entire populations, that the U.S. Air Force is now vigorously pursuing a new arsenal of land-fired, Inter-Continental Ballistic Missiles, or ICBMs.